Alpacas are members of the camelid family and are indigenous to South America where they have been domesticated for thousands of years. The alpacas come in two breed types: Huacaya (wah-kay-ya) and Suri (soo-ree) and are closely related to camels, llamas, guanacos and vicunas. The Huacaya (95% of worldwide alpacas) has fluffy hair that sticks straight out from their bodies and the Suri has hair that hangs down from their bodies in dreadlocks-like ringlets. You will find Huacaya alpacas on our farm. Alpacas are relatively small in size (about three feet high and 100-190 lbs), are easy to care for and generally live 15-25 years. Highly social and hierarchical, they are by nature friendly, curious, alert, calm and intelligent animals who communicate with a soft hum and other vocalizations and with body language such as neck posturing, ear and tail positioning, and head tilt. They have excellent eyesight and hearing and will alert the herd and their human keepers with a staccato alarm call if they perceive danger. Alpacas rarely spit at people unless frightened or abused, but will use this form of communication with each other to register a complaint. Alpacas do not challenge fences, the fences are very important to keep predators out. With padded feet, alpacas do not damage pastures as they graze. Alpacas are modified ruminants. They rank high in digestive efficiency and do well on good quality, low protein pasture and hays. Supplemental feeds, vitamins and minerals are provided when required. An alpaca costs far less to feed than most traditional domestic animals. Alpacas need basic shelter and protection from heat and bad weather. Like any other livestock, they require certain vaccinations and worming medicines. Because they are a fibre-bearing animal, annual shearing of their fleece in the spring is absolutely essential. They require regular toe clipping and occasional dental care. Alpacas have a single coat that come in 22 natural colours, ranging from pure black to greys, browns, fawns and pure white. The alpaca fibre was so prized by the Incas for its luxurious softness and durability that they reserved it for the noble class only. The fleece is comparable to cashmere and is recognized as an elite fibre because of its fineness, softness, light weight, durability, excellent thermal qualities and luster. The fibre can vary in length (from 3 to 7 inches) with variation of fineness and crimp. Due to the lack of lanoline (grease found in sheep’s wool) the alpaca fibre is considered hypoallergenic. 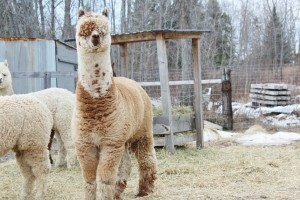 As part of Canadian Alpaca Breeders we strive to eliminate the presence of guard hair and to produce uniformity, fineness and density in the animals born on our farm. When paying attention to both our breeding program and the correct fibre handling procedures, we have seen a huge improvement in the quality of our fleeces each year and therefore of our finished products.